My baby has the most delicious thighs. Little pudgy rolls of yummy goodness. As I pulled him out of his highchair after breakfast today, a piece of strawberry and a couple of cheerios fell out from between his thigh rolls! At first I was amused. But then I silently prayed, Oh God please don’t let me ever get that fat so that could happen to me. Truth be told, I did look at the positive side in case I did get in that condition. For example, suppose I had to work through lunch. Instead of starving, I could just lift up my skirt, give my leg a little shake, and out would pop a pizza and a few fries. Pretty convenient, yes? But no, the social and health problems would definitely outweigh (haha) any advantages. So, out of fear of raising the next generation of thunder thighs, I am always challenging myself to find healthy but tasty meals to feed my family. Breakfast in particular has always been a hard meal for me to cook since I was never much of a breakfast person myself. I never knew what to make. 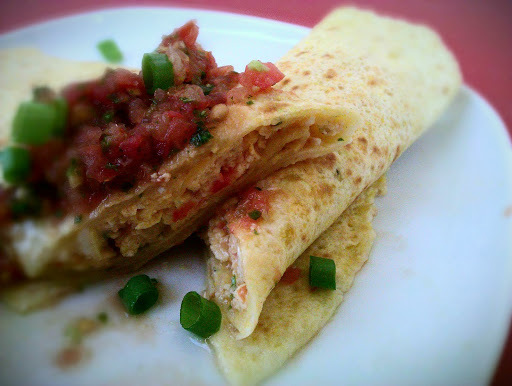 Then one morning, I came up with this breakfast burrito with tomato salsa recipe that is extremely satisfying and my go-to recipe for when I’m stumped on what to cook. It is also versatile, you could eat it for any meal of the day, and it can even be made with store bought salsa if you are in a time crunch. Heat a skillet on high, then coat skillet with cooking spray. Add the eggs, 2-3 tablespoons of salsa, and ¼ cup cheese. Add some fresh black pepper. Scramble all together until eggs scrambled and most of water is evaporated. About 2 minutes. Keep aside and keep warm. Heat a clean skillet on high heat, then coat skillet with cooking spray. Lower heat to medium and add tortilla and flip a couple times, about 3 seconds per side until tortilla is hot. Put ¼ cup cheese in a line down middle of tortilla and heat until cheese is melted. Transfer tortilla to plate. Immediately add half the egg mixture on top of the melted cheese and fold over both sides of the tortilla so it looks like a burrito. Top with salsa, sour cream, spring onions and avocado slices, or garnish as desired. Repeat whole process using rest of egg mixture and other tortilla. PREPARATION: Halve tomatoes and put in food processor (NOT blender) with the rest of ingredients. Pulse until desired consistency. Adjust seasonings to taste. 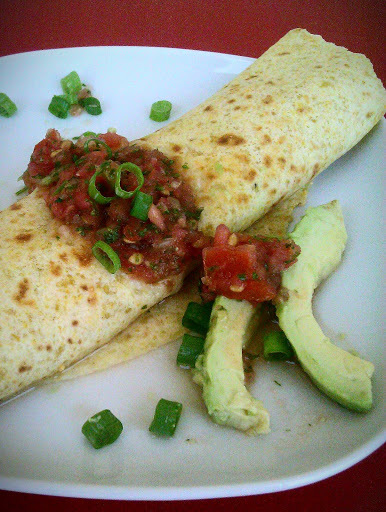 This entry was posted in Breakfast, Main Course, Vegetarian and tagged Breakfast Burrito, Quick Meals, Tomato Salsa, Vegetarian by thepantrydiva. Bookmark the permalink. Love your post! So cute. Welcome to blogging!